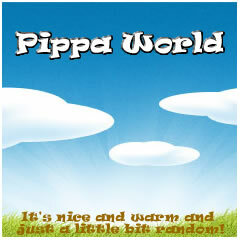 Pippa World: What's At The End Of The Rainbow? I was thinking last night on the drive home from the Theatre about the end of the rainbow. For Beverly and Sue and Angela, I'm pretty sure that they thought that marriage was the end of the rainbow for them and then when they got there, they discovered that it wasn't all happy ever after after all (Sue got a divorce, Angela was treated like a well, a woman in the seventies and Beverly was pretty evil really). So what is the end of my rainbow? At the moment losing the weight is my goal, so being the "right" weight for me is the end of my rainbow and I'm not sure what I'm expecting. Am I expecting that as soon as I lose all the weight I will magically be happy? Am I expecting that as soon as I lose all the weight I will magically be pretty? Am I expecting that as soon as I lose all the weight I will magically be proud of my body? Am I expecting that as soon as I lose all the weight I will magically be where I want to be in my life? I don't really have the answer to what I'm expecting. I know that I'm not going to step on the Scales and as I step off a magical pulse will cover the world and all the problems I think are in my life be made better, but I'm not so sure that I full understand that in my heart. I guess once I reach the end of the rainbow, I'll have to take it one step at a time.